We already have 'Eject' in the context menu of CD/DVD drive, which ejects the drive tray. But to insert the tray inside,we've to manually push insert button on CD/DVD drive. There is a workaround which lets you insert the drive tray without touching it physically. 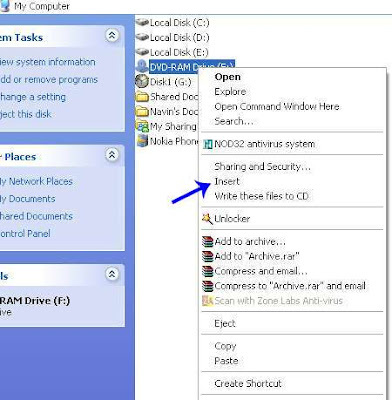 Simply by putting the 'Insert' sub-context(as shown in above figure) menu on CD/DVD drives Context menu. For this to happen, we've to call a dll file from our system32 folder. First of all, download this file CDEject.zip and extract it. There will be two files CDeject.dll and CDeject.reg. Now follow the step by step procedures. 2. CDeject.reg -> execute it. It shows a warning message, accept that and click OK.